With Thanksgiving right around the corner, I knew I wanted to share a perfect-for-fall dessert for those of y’all who are still planning your menus. 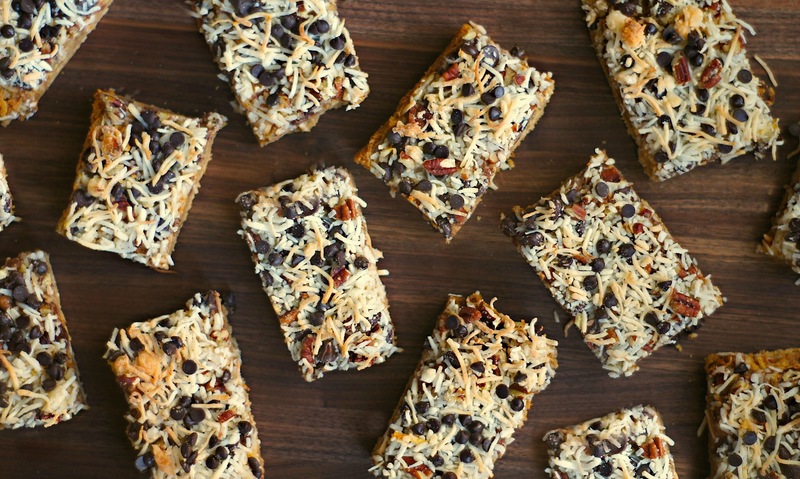 After reading through tons of potential recipes, I settled on these Seven-Layer Pumpkin Magic Bars, since they looked simple-to-make, delicious, creative, and good for a crowd. And now, after making them, I can tell you that they are all of those things and more! They are SO insanely tasty, and, SO easy to make. I timed myself, and it took me a mere 22 minutes (including the peeling/shredding of the apples) to get these prepped + in the oven. All the ingredients work beautifully, deliciously, surprisingly perfect together: the buttery graham cracker layer, the sweet spiced pumpkin + apple layer, the chocolatey chips, the crunchy chopped pecans, + the crisp toasted coconut. I would’ve never thought to combine all those things together, but now that I have, I can tell you that the result is DIVINE! One thing to remember, if you’re going to make these bars for Thanksgiving, is that these need time to bake, cool, + then chill them in the refrigerator. So you’re not scrambling for enough time to get them chilled, I recommend making them the day before, so they can have a full overnight to cool in the fridge. I hope y’all give these a try – I know that you + your family/friends will absolutely love them on your holiday table! Heat oven to 350 degrees F. Line bottom and sides of a 9×13 pan with aluminum foil, leaving a 1″ overhang on two sides (this allows for easy removal of the bars for cutting). Combine graham crackers + melted butter in a bowl, + stir until well blended. Press mixture evenly onto the bottom of the prepared pan. In a medium bow, combine sweetened condensed milk, pumpkin puree, cinnamon, nutmeg, + cloves, + stir until well combined. Pour the mixture over the graham cracker crust. Layer the shredded apples evenly on top of the pumpkin/condensed milk layer, and press down slightly. Sprinkle on 1 cup of the chocolate chips, the pecans, and the shredded coconut. Press down slightly again, to help all ingredients “stick” to the pumpkin layer. Finally, sprinkle the remaining 1/4 cup chocolate chips on top. Bake for 35-40 minutes, until bars are set + coconut is slightly browned (be careful, as coconut can turn from golden brown to burned quickly!). Cool at room temperature for about 30 minutes, then cover + transfer to the refrigerator to chill for at least 4 hours (or preferably overnight). When ready to serve, use foil overhang to remove bars from the pan, + cut into 12 or 16 bars, depending on how big you want them. Serve cold (straight from the fridge) or at room temperature. These would be so great to take somewhere too. You could even cut them in bite size pieces. Yummy. Amy, have a very happy Thanksgiving with your family. These bars look so delicious! Hope you had a wonderful holiday! LOVE these!! Such a special bar for the holidays! pumpkin AND apple in 7 layer bars?!? yum! these sound fantastic! Oh yes! Those look fantastic!!! Oh my gosh! Those look fantastic. 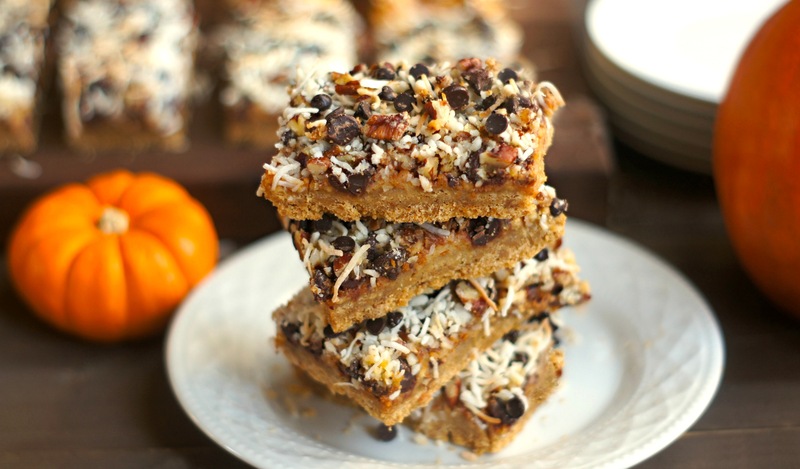 Ooo, I love me some magic bars so I’m all over this pumpkin version! What a fantastic twist to such a classic dessert! What a great idea, and these would be perfect for the children at the Thanksgiving table… not to mention moms who have the 3:00AM munchies! Happy Thanksgiving to you! Ha, yes! I let my daughter try a few nibbles of one yesterday and she LOVED it. =) Happy Thanksgiving to you, too, dear Adr! I think this could even win over the pumpkin haters! Looks delicious. I think so, too! The pumpkin flavor is much more mellow than it is in, say, straight-up pumpkin pie. Happy Thanksgiving! These bars look incredible! Perfect for the occasion! Have a lovely Thanksgiving! These look like a perfect Thanksgiving treat! I love the combination of fall flavors, including both apple + pumpkin! Happy Thanksgiving! I wouldn’t have thought to put these ingredients together either. But they sound wonderful – a perfect fall dessert!